The kick off of the 2014 Swan Market season starts with a swinging festival in the Fenixloods. This robust, typically Rotterdam location is the place to be this weekend. Since it is inside, a little bit of rain now and then doesn’t matter. There will be food and drinks and more important a lot of cool stuff. 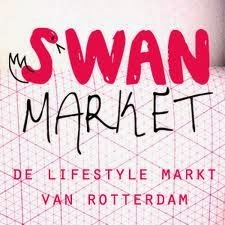 Looking for a nice present or something for yourself, don’t hesitate and visit the market. It’s for free! And there will be live performances as well. Hope to see you this Sunday! Enjoy your weekend!